Bambo Nature diapers: We like these the best out of the diapers we tried. They’re completely compostable in commercial facilities (not in your home compost bin, and not in our municipal compost bin either because they don’t want human waste in there) and soft. We have tried Pampers (we like the wetness indicator, but felt guilty about the amount of plastic involved; newborns especially go through a lot of diapers), Huggies (I think Pampers were better), Honest (super cute! But the compost service does not compost this brand), Naty (not bad but a little stiffer feeling? ), and cloth. We got Tiny Tots diaper service, first with cloth, and it was fine but wetter, so we used disposables at night. (Even then it felt like we were washing diaper covers all the damn time.) They also have compost service, or a combination. We started with cloth, then combination, but after we started day care, cloth diapering just felt like more trouble than it was worth. I highly recommend Tiny Tots in the Bay Area though. And Bambo diapers. Ubbi steel diaper pail: You can use any trash bag (we use our big compostable trash bags) and it really does keep the smell in. Well except for when you open it to put the diaper in; there’s nothing that can contain that. Chux: Those blue hospital underpads have saved our bed so many times, plus it’s nice for when we’re out of the house. We’ve changed her on a picnic bench, Target bathroom, front seat of a car, etc. I think a washable underpad would work too, but definitely something waterproof. (We didn’t buy a changing table because it seemed so unnecessary, but we have friends that really liked theirs because they felt like it made the changing easier on their backs.) We got the smallest 17″ x 23″ size. Oh if you are going to be changing your baby on your bed, buy a waterproof mattress protector. Actually, everyone should have a couple of these. Even with sheets, you sweat and shed skin and hair and stuff, and maybe your rabbit revenge peed on your bed, and maybe your baby sat up and peed before you got the new diaper on and with a waterproof protector (like a fitted sheet but waterproof) you throw everything in the wash and it’s all good. Diaper cream: We use Grandma El’s every diaper change and she’s never had a rash. But I think any diaper cream would be fine. Graco Pack ‘n’ Play playard: The mattress isn’t as nice as a regular crib mattress but it works great as a travel crib, and as a place to put the baby when you need to do something quickly. I think it would be fine as a full time crib too. Boon Lawn drying rack: We actually have the smaller Grass with Stem and Twig, but I think a bit of extra space especially if you’re pumping is probably a good idea if you have space. Fisher-Price Health Care Deluxe Booster Seat: We got this instead of a high chair and it’s worked out really well. Easy to travel with too. Bumkins Sleeved Bib: Food is messy. I wish we had gotten this sooner. Plastic with long sleeves with elastic wrists, ties in the back instead of velcro. Baby Bjorn Carrier One: We used this even more when she was younger, but it’s still super awesome when we do use it. When she was very little, sometimes she just wanted to be carried for very long periods of time which is super tiring without a carrier. And then once her neck was a bit steadier, she loved being in it and looking outwards at everything. Plus it’s nice to be able to hold her and do stuff. Combi Coccoro car seat: We decided to buy a convertible car seat instead of an infant car seat because the infant car seats aren’t really useful past six months or so (I don’t think anyone wants to carry the car seat and the baby after a certain weight) and I just didn’t see the point of buying a one to two hundred dollar infant car seat when there are convertible car seats that can work for longer than a year max, especially since we don’t own a car. (You still need a car seat to take the baby home from the hospital and other car trips.) We picked the Coccoro because it was one of the smallest and lightest but still well rated for protection one I found. I don’t think installation is super easy, but overall we like it. Safety 1st Sleepy Baby Nail Clippers: There’s an LED light in the front so that you can cut nails in poor lighting with less fear about drawing blood. Yut’s even cut her nails in the dark. Actually he prefers to do it when she’s getting her last feeding at night because she’s moving less. Exergen temporal thermometer: I know rectal thermometers are the gold standard, but dude, this is just easier to use and keep clean. Actually, I’ll say this: even if you don’t have kids, this is a good thermometer to have. Takes a few tries to learn how to use it, but easy once you figure it out. I think any temporal thermometer would be fine, this was available at Costco. First Years Sure Comfort Deluxe tub: I should think any of them in this style are fine. The sling is super useful with newborns. Easy to use. We tried the Puj and I guess if your sink is the perfect size it might be fine but for us it didn’t work at all. SwaddleDesigns Sleeping Sacks wearable blanket: Babies move around a lot, so it’s nice to have a blanket that moves with them. They have different weights so you can pick what you like. Actually any sleep sack/wearable blanket thing is fine. We like this one because the two way zipper can be opened from the top or bottom which is nice when you want to take the baby out vs change her. Flap Happy Spandex Flap Hat: Good sun protection, easy to put on (because it’s like swimsuit-like material). Also Nozone Beach Coverup as a nice light jacket. JJ Cole urban bundleme stroller blanket: It’s a sleeping bag for the stroller, super cozy. We basically dress her for indoor comfort, then put her in her bundleme with a hat and zip lower when it’s warmer, or higher when it’s colder. We got the urban version which is water resistant (not proof) — enough so we’ve used it in drizzle and so the outside is easy to wipe. Buy the toddler size, even if your kid is younger since it’s just longer as far as I know. Stroller wise, I definitely think it’s a buy! We love taking walks with her, and she loves the change of scenery. We’ve used an Uppababy Vista and a Bugaboo Bee, and we like both a lot, you can’t go wrong with either, but I can’t say either are the best strollers — we like both for different reasons and didn’t try a lot of them since friends lent/gave us theirs (for which we are super grateful!). They’re both high end and expensive, I think. I would say that the Uppababy Vista is a more full size stroller, seems really cushy (suspension?! Do strollers have suspension? ), great sun shade, rolls over pot holes with ease, etc. But the Bugaboo Bee is smaller and lighter. They both have the reversible seat (so you can have the baby face you), which we think is really nice. She’s facing forward now because she likes to look at everything, but when she was younger, she liked being able to see us and we liked being able to see. Also, cup holder. She asks if I have this game. No, I don’t. In fact, I hadn’t even heard of it. Well, I have now! It’s like an unholy cross between Farmville, Tamagotchi, and Pokemon, and I am addicted. 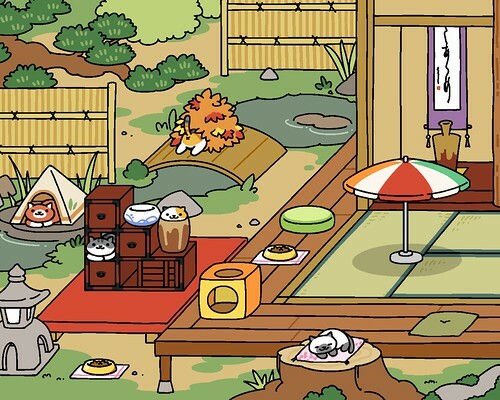 I check my cats all day, and take pictures, and yet, it’s a nothing kind of game. Sheesh. Surprise! We built me a new computer. Mostly, I am so tired nowadays that I barely use my computer, so this was unexpected. BUT when I do, it feels like it’s even nicer when things happen fast. 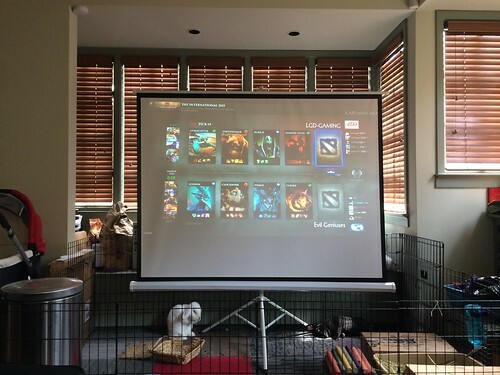 AND on top of that, I was starting to be the last person to load on Dota when we played! Not ok.
Intel Core i5-6600 3.3GHz Skylake Processor: Honestly I was going to get an i5-6500, but when I purchased, SuperBiiz was having a small special on the 6600 so it was only a little more, so I thought heck why not. Asus H170M-Plus/CSM: I used to always buy the motherboard with the chipset that would allow me to overclock and whatnot, but I decided I had to be honest with myself: I don’t overclock. I think I did my last one like the smallest amount just for fun, and then lost interest and never dealt with it again. So… I went with the H170 chipset instead of the Z170. And Asus because we’ve had good experiences with their mainboards. G.Skill Ripjaws 4 series 16GB (2 x 8GB) DDR4-2133: Plenty of memory! Samsung 850 EVO 500GB M.2-2280 SSD: So damn cool! I wanted a bigger C: drive — my last one was just 90GB and it just felt like I had to spend thought on space more often than I liked. I had shifted my profile and game files (Steam library mostly) to different drives to be sure that my C: drive never filled up. This hard drive is a new form factor for me! I hadn’t realized hard drive technology had gotten so small. It’s a little board with chips on it, about the size of a large USB thumb drive, that plugs in directly to the motherboard, no power or SATA cable to snake around. My computer is super cramped so it felt like this was a worthy upgrade. SeaSonic X Series 850W 80+ Gold Certified Fully-Modular ATX Power Supply: Okay, technically I don’t think I needed a new power supply, but this was on sale and it’s Gold certified (more efficient) and fully modular and etcetc. So… I got a power supply. I did keep my case, the Silverstone TJ08B-E MicroATX Mini Tower Case. It’s a nice case! But, a serious pain to build with because everything is so cramped. I also kept my heatsink and fan, a Xigmatek Gaia SD1823 (discontinued now). It was so very dusty! But we cleaned it up and put a drop of thermal paste (we had some old stuff lying around) on it and slapped it on. When we first put it together (granted this was mostly Yut), it kept restarting itself… I thought it didn’t even post. And it was so late and we were tired, so we just left it. 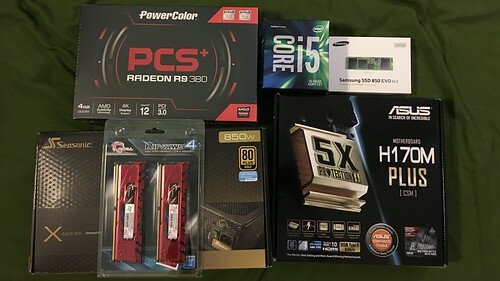 I thought we’d have to test the motherboard and case connections, maybe reseat and test everything, and was so not looking forward to it. But when we tried it the next night, Yut pushed the reset button and who knows, maybe it got a bit stuck while we were building the computer, but it worked! So… I’m typing now on a new computer! I think it’s actually one of the few (only?) times that a new build just worked right away (barring the restarting the first night which really didn’t require fixing beyond a button press). It feels super speedy now. And the best part is, it’s even quieter than before. 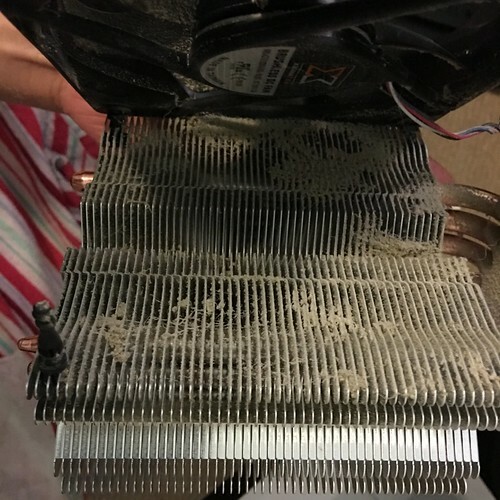 Maybe getting rid of the dust is helping the heat and the fans don’t have to work as hard, or the new parts are quieter, or who knows. But it’s awesome.